We record in Andrew’s apartment on Christmas Day. We talk long and hard about Star Wars The Last Jedi. We spoil almost everything. If you haven’t seen it, go see it, and come back to us. We discuss our favorite things we saw, played and read this year. We could talk for hours and hours about all the things we liked this year and we nearly do. Each Brother gives us his hopes for the coming year and beyond. And we make a resolution! We will record two episodes a month! We promise! (Please don’t hate us if we can’t live up to our promises, like Andrew Garfield said in Amazing Spider-Man, making promises you can’t keep are the best kind). From all the BrothersGeek to all our dear Listeners, have a safe and happy Holiday Season and see you all in 2018! 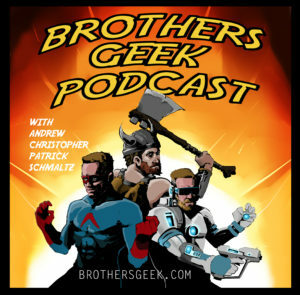 This entry was posted in Podcasts on December 27, 2017 by BrothersGeekadmin. Eighty-Three: The One Before the Brothers see The Last Jedi. Hello everyone and welcome back to our podcast! We catch up after weeks of not talking to each other, like at all. Christopher is a little salty about this and he calls Patrick out. We overcome technical issues. This podcast is NOT SPONSORED by SKYPE. We work on a new platform and things are much improved. We talk Justice League. We talk the CW Arrow-verse Crossover event. And which was better, and you might be surprised how it comes out. Our Not Ugly Award goes to Jason Momoa. Congratulations Aquaman! We, again, sing the praises of Marjorie Liu’s and Sana Takeda’s Montress. Christopher plans on recommending it for book club. We plan on lots more play in Destiny 2 now that the Curse of Osiris DLC has dropped. We have all made plans for to see Star Wars The Last Jedi the week of release. We are literally vibrating with excitement. Our trivia is Star Wars themed. Christopher ALMOST pulls it off, Rain Man style. Our next episode will be our In-Person Holiday Year End Review!